Did you know that NEXUS has a wealth of informative workshops and website information on Cymbals? Bob Becker has an excellent lecture-demonstration called The Magic and Mystery of Cymbals which is described in detail here . You can also find Bob discussion of the cymbals he used (and why — with photos) at a performance of his piece Unseen Child in Madison Wisconsin. His set-up for Unseen Child included one Wuhan Chinese and five Sabian cymbals including a custom-made 20″ sizzle. 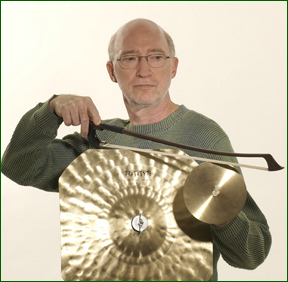 (You can hear this cymbal, among others, played by Garry Kvistad in the performance of Unseen Child on the NEXUS CD Wings). In the article, he also mentions the Becker Bowing cymbal that he produced with Sabian. Bill Cahn has a lecture demonstration on approaches and techniques applied to performance on standard orchestral small percussion instruments including cymbals. He includes taped examples from the standard symphonic repertoire with simultaneous live performance! Also, have a look at Bob’s terrific article entitled Some Thoughts and Information Concerning Cymbals. In it he discusses Some General Performance Concepts for Cymbal Playing, the Etymology of the word Cymbal, and provides A Brief History of the Modern ‘Turkish’ Cymbal and the Mehter Bands. Fascinating stuff! Bill also has an interactive discussion/demonstration called What to Listen for in Cymbals. Check out his description of it, because he provides a list of Techniques for Listening, and Seven Concepts of Listening with various associated questions: (1) Listen to the “white noise” (“shhh” or “sss” sound) (2) Listen to the “fundamental” pitch (low tone that you can hear and sing) (3) Listen to the relationship between the “white noise” and the “fundamental” parts of the overall sound (4) Listen to the range of “harmonics” (component “overtones”) (5) Listen to the relationship of the “white noise” and the “fundamental” sounds to the overall sound (6) It’s mainly the sound of a cymbal that determines it’s relative brightness or darkness (7) The weight (mass or thickness) of a cymbal affects it’s sound. Bill has a second interactive discussion on that page concerning cymbal performance on both suspended and crash cymbals. With this wealth of expertise, It is not surprising that Bob and Bill were honoured by cymbal manufacturer SABIAN Ltd. with its ‘Lifetime Achievement Award’ in 2005. The late John Wyre was also a recipient. Past recipients of the Award included (among others) Alan Abel (Philadelphia Orchestra), Vic Firth (Boston Symphony), Morris ˜Arnie’ Lang (New York Philharmonic), and jazz greats, Roy Burns, Jim Chapin, Joe Morello, Ed Shaughnessy and Ed Thigpen, and of course there have been several recipients since, as well. Do have a look around our website, and use the Search box. You never know what you might find!